The best way to interview people at a grid-wide Second Life event is simply to do a shout out. I'd taken pictures of SL8's birthday party on my real-life vacation. I wanted only those interested in networking with me to come forward so I said in the group chat, "Who wants to be interviewed?" One of the first people to reply was Ludo Merit. 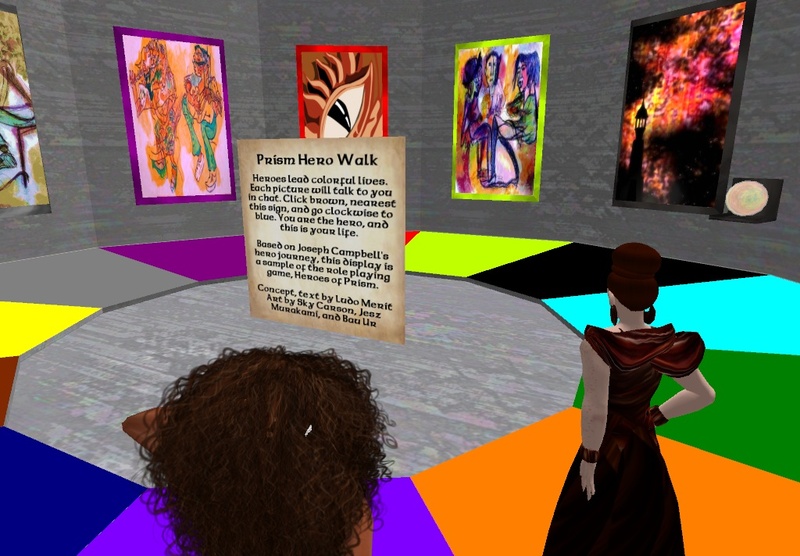 The concept for Merit’s Prism Hero Walk was created in the late 1980s. She first considered her idea a game. "But as I developed it in Second Life, I began to see that my 'market' is not gamers, but helpers and those who needed help," Merit expressed. "I played with the idea for years, and then I heard about SL and came here specifically to develop it." She read Sam Keen's "The Passionate Life' and Max Luscher's "The Luscher Color Test" at the same time and put the two together. Shortly after she read about Joseph Campbell's hero journey and went to the Mythic conferences in Georgia, she merged the colors of the hero journey with Sam Keen's life stages. "Because we are all heroes, and each of these steps is a step in the life of a hero according to Campbell, it's called a hero's journey rather than an individual's. The journey was created from myths and legends from all over the world. Brown tells of your parents’ unconditional love and need to protect you. It helps you to understand why you leave the safety of your home to explore. Yellow declares a child's need to explore. You make friends and discover they have different approaches to play and lifestyle. Gray symbolizes the beginning of rebellion and finding one's own path. Purple is the age of self discovery. Drifting, dreaming and setting goals. Red has you coming forward to take your place in society. You have to prove you’re worthy of a quest. Chartreuse places you into your quest and down the path of obstacles. Black signals loss and the desire to get it back. Aqua is returning from the journey, tired, scarred and having personal growth. Green names you as an experienced member of society. You are now known for your wisdom. Orange has you recognizing the fact that change is necessary. Violet symbolizes the jester/fool who is not afraid to express him or herself. Blue leads you to the realization that your quest has ended and now you can focus on yourself. "People who read and answer the questions for themselves, I hope, see that their lives are very much like the Campbell hero life," said Merit. "Most of all, know that you are a hero, that we all are heroes and every kind of hero is needed.